See how the legend of the Scorpion King began! 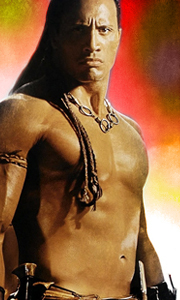 When a young Mathayus witnesses his father's death at the hands of the king (Ultimate Fighting Championship winner Randy Couture), his quest for vengeance transforms him into the most feared warrior of the ancient world. From the director of Resident Evil: Extinction and Highlander comes a heroic adventure filled with heart-stopping action and thrilling visual effects!.. The Scorpion King: Adventure rules! The spectacular Mummy series explodes into a new realm of breathtaking, non-stop action in The Scorpion King! Unleashing WWE superstar The Rock as the most fearsome warrior of the ancient world, The Scorpion King plunges you into a sweeping tale fled with stunning fight sequences, awe-inspiring battles and pulse-pounding thrills. It’s the ultimate special effects-powered epic and the must-see-and-see .. THE SCORPION KING: Inspired by the hugely successful 'Mummy' series, 'The Scorpion King' is an action-packed epic adventure filled with spectacular stunts and fight sequences. In a time of darkness and in the face of evil, one man dared to fight back. Utilising his combat skills as an assassin, wrestling sensation The Rock stars as the warrior who defies an empire to become a legend and unite a nation. THE SCORPION KING: RISE OF A WARR.. Since his triumphant rise to power in the original blockbuster The Scorpion King, Matthayus' kingdom has fallen and he's lost his queen to plague. Now an assassin for hire, he must defend a kingdom from an evil tyrant and his ghost warriors for the chance to regain the power and glory he once knew. Starring Ron Perlman (Hellboy) and Billy Zane (Titanic). The Scorpion King 3: Battle For Redemption takes The Mummy phenomenon to an all-new..
Join an exciting new chapter in the action-packed series from the producers of The Mummy! After the king of Norvania is assassinated, the legendary Scorpion King Mathayus is framed for the crime and must fight off an entire kingdom of soldiers. Now Mathayus (Victor Webster) and his only remaining allies, a mysterious woman and her unconventional father, are the last hope to stop the evil heir to the throne on his quest for an ancient an.. Adventure rules! The spectacular Mummy series explodes into a new realm of breathtaking, nonstop action in The Scorpion King! Unleashing WWE superstar The Rock as the most fearsome warrior of the ancient world, The Scorpion King plunges you into a sweeping tale filled with stunning fight sequences, awe-inspiring battles and pulse-pounding thrills. It's the ultimate special effects-powered epic and the must-see-and-see again adventure of.. Inspired by the hugely successful 'Mummy' series, 'The Scorpion King' is an action-packed epic adventure filled with spectacular stunts and fight sequences. In a time of darkness and in the face of evil, one man dared to fight back. Utilising his combat skills as an assassin, wrestling sensation The Rock stars as the warrior who defies an empire to become a legend and unite a nation. Also starring the seductive Kelly Hu (Sunset Beach) a.. THE SCORPION KING: Inspired by the hugely successful 'Mummy' series, 'The Scorpion King' is an action-packed epic adventure filled with spectacular stunts and fight sequences. In a time of darkness and in the face of evil, one man dared to fight back. Utilising his combat skills as an assassin, wrestling sensation The Rock stars as the warrior who defies an empire to become a legend and unite a nation. Alson starring the seductive Kelly..